Conor Benn 148.5 vs Josef Zahradnik 145.3. 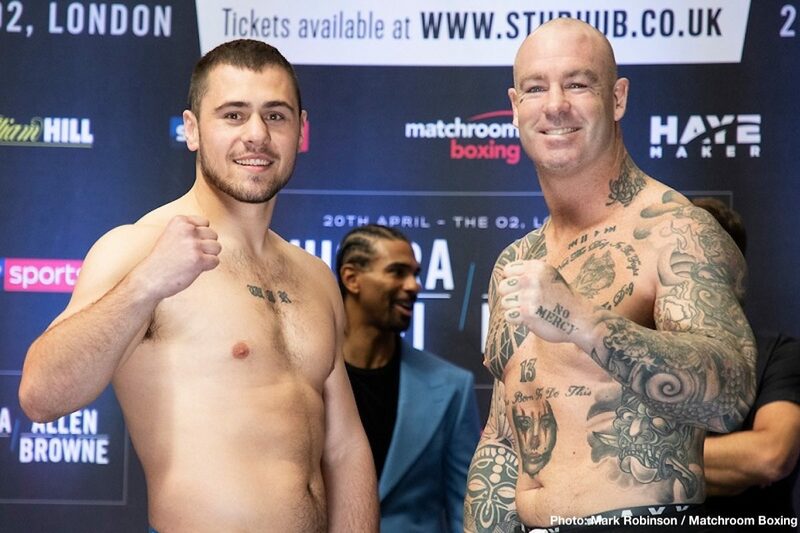 Dave Allen faces the biggest night of his career when he takes on former WBA World Champion Lucas Browne on a blockbuster evening of Heavyweight action at The O2 in London on April 20, shown live on Sky Sports in the UK and DAZN in the US, that sees Finchley bad boy Derek Chisora return to the ring against Senad Gashi after his FOTY contender with Dillian Whyte in December. ‘White Rhino’ is in the form of his life after notching successive stoppage wins over Nick Webb, Samir Nebo and Ariel Esteban Bracamonte in the second half of 2018. The Doncaster fans’ favourite rich vein of form began with a “life-changing” fourth round knockout win against Webb at The O2 in July and he hopes to make it three KO’s from three fights at the Greenwich venue next month. 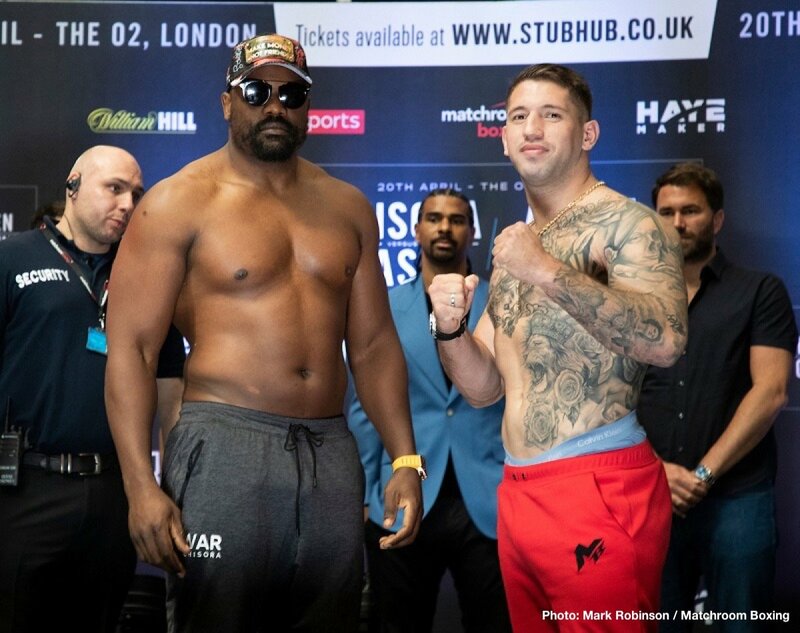 Browne returns to the scene of his sole career loss to Dillian Whyte determined to redeem himself with a big knockout win over cult hero Allen. Since that loss the 28-1 Australian, who’s career-best win came against Ruslan Chagaev in 2016, has bounced back with three wins and he believes another victory on April 20 will fire his name back into the World mix. “I have never trained so hard in my life,” said Allen. “I’m going to knock Browne spark out, I hit too hard for him. Even though there’s no animosity in the build-up, I want to punch him all over The O2 in to row Z. “Lucas Browne isn’t the Lucas Browne who beat Chagaev, he’s a faded force. That being said he’s still very dangerous, he does have that power, but this fight is perfect for me. He’s a former World Heavyweight Champion. A win here puts me on the big stage, not the highest level, but within touching distance of a fight that would then put me there. “I’m eager to redeem myself at The O2 and will be coming for a knockout,” said Browne. “I’m a fan of Dave, I have nothing bad to say about him and I’m looking forward to a good old-fashioned brawl on April 20. This is the fight for me to showcase who and what I am to the masses. It’s a blockbuster fight and I know Dave is a big crowd favourite but that will drive me on to silence the fans. Former World title challenger Chisora came sensationally close to beating Whyte in December. Going into the eleventh round of an exhilarating and brutal fight, Chisora was ahead on two of the judges’ scorecards only to be caught by a devastating left hook. Having recently teamed up with highly-respected trainer Dave Coldwell, Chisora is feeling refreshed, revitalised and ready to take on any challenges in 2019. “Six weeks ‘til I go back to WAR and boy I can’t wait!” said Chisora. “On Saturday 20th April I will be stepping into the ring at The O2 with fire in my soul, I have a point to prove and mission to continue. “Parker b*tched out, he must have taken too many laxatives and sh*t himself. He wasn’t ready for the battle, he reckons he needed more time. Gashi has shown he is a true fighter, he is always ready to go to war when called. He showed this in December when he stepped in the ring with Takam on just one week’s notice and gave him a real fight. I’m not stupid, I know with six weeks’ notice in April Gashi will be a different animal. Some of the best up-and-coming talent Britain has to offer get the chance to showcase their skills to the masses once again as Sunderland’s ‘Pretty Boy’ Josh Kelly takes on the toughest opponent of his career to date in the form of unbeaten 17-0 Pole Przemyslaw Runowski. Cardiff’s ‘Welsh Wizard’ Joe Cordina picked up the Commonwealth Lightweight crown in his last outing against Sean Dodd and he steps up again on April 20 to take on Barnsley ‘KO Kid’ Andy Townend for the vacant Lord Lonsdale belt. Ilford Welterweight Conor Benn makes his long-awaited return to the ring following a hand injury that kept him out of action since his first title win over Cedrick Peynaud in July, and ‘The Destroyer’ in promising another explosive performance as he looks to pick up where he left off. “I’m excited to be back at The O2 for this big Heavyweight double header,” said Eddie Hearn. “Dave Allen has become a cult hero over the last year but this time he is in deep against former WBA World Champion Lucas Browne. Browne who lost to Dillian Whyte at the same venue just under a year ago has bounced back with three wins since and is looking for a shot at one of the big boys. For Dave, this is a dream chance to catapult himself into the big time in a vibrant Heavyweight market. David Haye of Hayemaker Promotions said: “On Saturday 20th April Hayemaker Promotions are excited to be back at The O2, the home of British Boxing. Once again working in partnership with Matchroom Boxing, we are looking forward to bringing fight fans an electric night of boxing with show reel knockout endings! Tickets for April 20 are priced £40, £60, £100 and £200 (Inner Ring VIP). General Sale tickets are available to purchase at midday on Wednesday March 13 from StubHub.